Plot: 5/5 Great addition to the Maybe series. 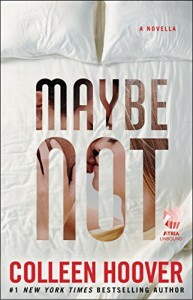 While reading Maybe Someday, I knew there was more to Warren and Bridgette's Story. I loved how this all played out. The Feels: 4.3/5 They were confusing but ultimately good. I'll let you in something; I love Maybe Someday, it's seriously in my top three of all time. I know a lot of people think it's about cheating, but I don't think that at all. It's about two people who were in love with each other, who have grown apart, but they don't want to admit it, because they love each other too much. There is a big difference between being "in love" and loving someone. It's about letting yourself move on.